In a hot pan, add a splash of oil and cook your chicken through until piping hot, and slightly browned on the edge. Then drain off any excess liquid and sprinkle in the Smoky BBQ Seasoning Mix, before adding 50 ml of cold water to the pan. When it is boiling, it’s time to stir it up. Reduce the heat to a simmer and leave uncovered for 10 minutes, stirring occasionally. 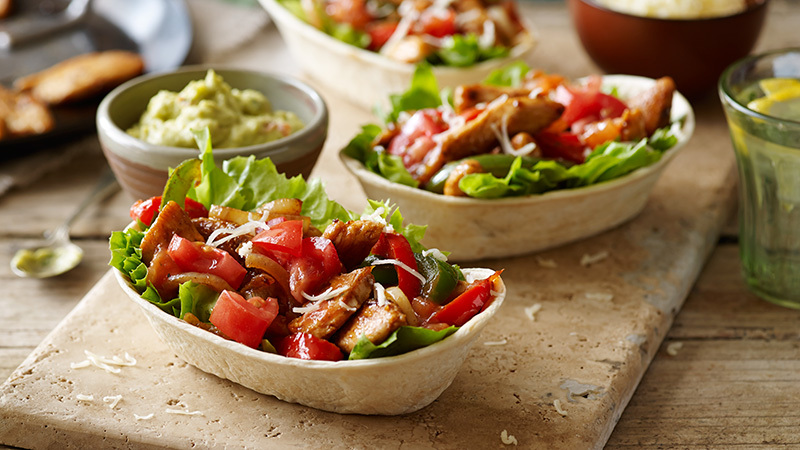 Fill your Stand ‘N’ Stuff Soft Flour Tortillas with your freshly cooked smoky BBQ chicken filling and top with freshly diced tomatoes, chopped lettuce, the provided Taco Salsa and grated cheese – then get stuck in!